A version of this article originally appeared on PRDaily. Content marketing has become one big M.C. 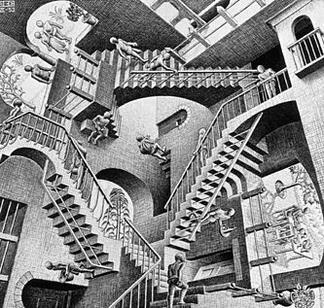 Escher painting – people create content about how to create content, which creates more content, forcing more content about creating content that rises above the content everyone else is creating. This has led to media publishers cutting journalistic staff in favor of algorithms that optimize their web content based on clicks. The AP is using artificial intelligence to automate some of their stories. Facebook famously let go of the human editors curating their Trending Topics section in favor of the newsfeed algorithm. You see, when you’re only concerned with optimizing numbers on a spreadsheet, the machines will always win out. And while that approach may drive more clicks, that’s about all it does. It doesn’t build brands. It doesn’t drive customer loyalty. It doesn’t create advocacy. And it reduces content to its lowest common denominator. Don’t let your brand make the same mistake. Don’t build a content strategy just to drive more clicks. Build one that will build your brand, help your customers, and increase your employee’s morale. Unfortunately, most brands get overwhelmed by all the content marketing best practices, tools, and gurus and totally miss the resources right under their noses. You are already creating the content your customers want most – you’re just not using it. In the rush to create more memes and GIFs that will drive more clicks, brands are forgetting about the content their customers actually want. Your best content doesn’t come from Photoshop, but from your own offices. Your customers want to hear about your brand’s history, how your products are being used, the “why” behind business decisions, your causes, your culture, etc. If you’re a tool brand, why are you trying to out-GIF your competition? Why aren’t you talking about how your tools are used? About what they can create? This content already exists. It just needs packaged for public consumption. You already have hired most of your content creators – you’re just not activating them. From R&D to customer service to operations, your brand is loaded with expert sources. These sources can give your customer insights into your brand, into your products, and into the category they literally cannot get anywhere else. You tell me what’s more “valuable” – another Valentine’s Day meme or a story about how your latest product was developed? You’re already paying these content creators. Why not leverage their expertise? You already have most of your assets – you’re just not using them. If you’re a car brand, share photos of cars. If you’re a tool brand, share pictures of your tools in action. If you’re a restaurant, share photos of your food. It’s why Honda’s Instagram strategy is all about sharing photos of cars. And why Stoli’s is about bottleshots. And why GE has created an entire magazine that dives into all the aspects of the company’s business. This isn’t rocket science, but it does require access, creativity, and storytelling.